Check out Erik's project. 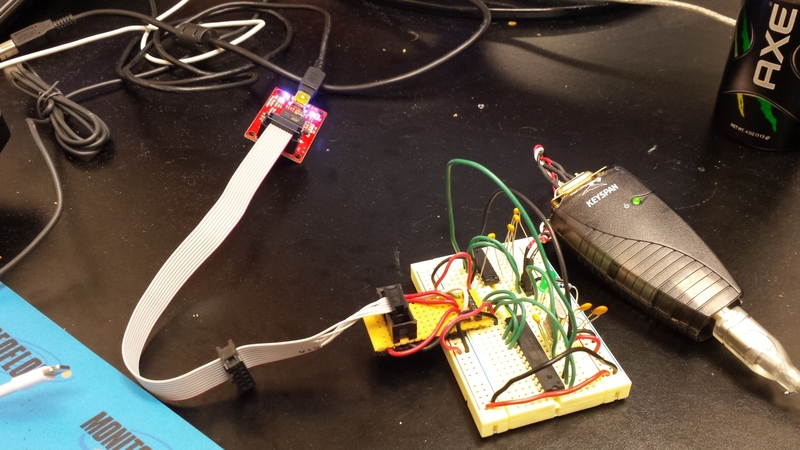 He demonstrates using an external timer for his ATMega 168 microcontroller to achieve a more accurate timing rather than using the internal timer. Instead of showing his output on an LCD, since he didn't have enough pins available for the LCD's 8-bit interface, he chose to show the results through serial communication on his computer. I have a larger ATMEGA324P, but I wanted to try doing this with a smaller ATMEGA168-20PU microcontroller. The original goal was just a timer, which shows how to use a crystal and capacitors to make it be more accurate than the internal timer. However, then I had to figure out how to get the fuses to work, so I used a fuse calculator to get the ATMEGA168's fuses for my 10Mhz clock. (http://www.engbedded.com/fusecalc/). I then had to figure out how to change my USBTiny stuff in ATMEL Studio from your ATMEGA324P to the ATMEGA168, which I did, and then add those fuse comments. I added them in the comments of my C code. Then I was going to output the clock on an LCD, but your demo only works for 8-bit bus, and I didn't have a freed up enough bus to do that. The ATMEGA only has two full 8-bit buses, port B and D, and I need some of port B for the crystal, and some of port D for interrupt for your LCD demo, so I couldn't do it. So I tried my hand at figuring out RS-232. So, I had a spare MAX232N chip sitting around and some 0.1uF caps and put that all together. OCR0A = 244;	// 0.0001024 * 244 ~= 0.025 SIG_OUTPUT_COMPARE0A will be triggered every 0.025 seconds, or 40 times per second.